Everything you always wanted to know about coffee! Frosty Frog Creamery & Café uses only freshly ground beans from the finest roasts available with every brewing of our rich Espresso, Latte, Cappuccino, Macchiato and house blend coffees. 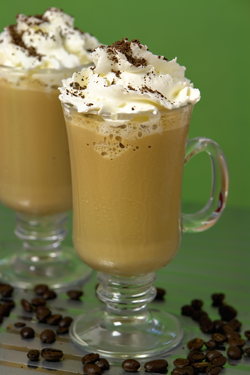 Our Espresso-based specialty drinks are custom made to your taste for maximum coffee enjoyment. Whether you like your coffee hot, strong, mild, over ice or blended in a frozen drink, our baristas take great pride in delivering a great cup of coffee to our guests every time! We feature Lavazza Espresso. We find that the full bodied taste, chocolate undertones and the creama produced from the Arabica Bean roast gives the flavor, taste and aroma that will delight the most discriminating coffee drinker. Our House Blend coffee is a medium roast of three coffee beans: Costa Rican, Guatemalan and Colombian. Each of these regions produces a bean with its own unique flavor qualities. Our unique house blend of these beans produces an outstanding cup of coffee. Almost everything you wanted to know about coffee… But didn’t want to ask! Coffee beans are actually the “pits” or seeds of the red berries that grow on the coffee plant. Coffee plants are evergreens that only grow in the tropical regions of the world. The only state in the United States that produces coffee is Hawaii. There are two major types of beans: Arabica and Robusta. Arabica beans are grown at high elevations and are characteristically hard beans with superior flavor and aroma, and a rich taste. Robusta beans are grown at lower elevations and typically have a harsher taste and up to double the caffeine content of the arabicas. Different strains of coffee beans have their own special characteristics that will vary from country to country and region to region. Roasting will determine whether the bean is used for brewed coffee or espresso. Caffeine is a mild stimulant that naturally occurs in hundreds of plants, including coffee. The general consensus seems to be that caffeine is good for you in moderation and is bad for you in excess. Arabica beans generally have less caffeine than the robustas; this is one of the reasons people often find that drinking a higher grade of coffee seems to reduce the caffeine side effects. Did you know that a cup of brewed coffee contains more caffeine than an espresso drink? It’s true! Why? It’s because the extraction process of brewing is slow and the water stays in contact with the coffee for a longer period. Thus, the longer the water contact, the more caffeine that is extracted from the coffee. In its green state, the unroasted bean has an earthy smell and exhibits none of the attractive, aromatic characteristics of the roasted bean. Roasting is the process of transferring heat from the roaster to the coffee beans. During the roasting process, certain flavor oils, waxes and acids are burned off the beans. At the same time, other desirable characteristics are developed which we enjoy in the smell and taste of coffee. This is why you get such different flavor profiles from the same bean when it is subjected to different roasts.